Dr. Sidey-Gibbons holds an honours bachelor's degree in mechanical engineering from McGill University in Montreal, Quebec (2011). 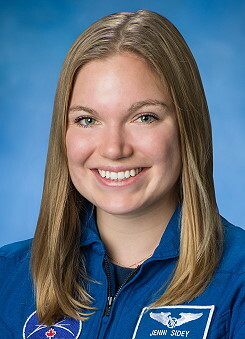 While at McGill, she conducted research on flame propagation in microgravity in collaboration with the Canadian Space Agency (CSA) and the National Research Council Flight Research Laboratory. She then moved to the United Kingdom (UK) to earn a Ph.D. in engineering with a focus on combustion from the University of Cambridge (2015). Prior to joining the Canadian Space Program, Dr. Sidey-Gibbons worked as an assistant professor in internal combustion engines at the Department of Engineering of the University of Cambridge. The focus of her research was flames, how we use them, and how to stop them from emitting harmful pollutants. Precisely, she worked on the development of low-emission combustors for gas turbine engines. She also taught undergraduate and graduate students in the Energy, Fluid Mechanics and Turbomachinery Division on topics ranging from conventional and alternative energy production to introductory thermodynamics and flame physics. Aside from these formal responsibilities, she also actively acted as a role model for young women considering technical careers in science-related fields. Most notably, she is the co-founder of the Cambridge chapter of Robogals, a student-run international organization that aims to inspire and empower young women to study STEM through fun and educational initiatives. Through this work, she has taught programming to over 3,000 young girls across the UK. These outreach activities, along with the technical success she achieved in her academic career, led to her receiving the prestigious Institution of Engineering and Technology's Young Woman Engineer of the Year Award and a RAEng Young Engineer of the Year Award in 2016. Dr. Sidey-Gibbons enjoys cycling, rugby and teaching. Last update on September 20, 2018.